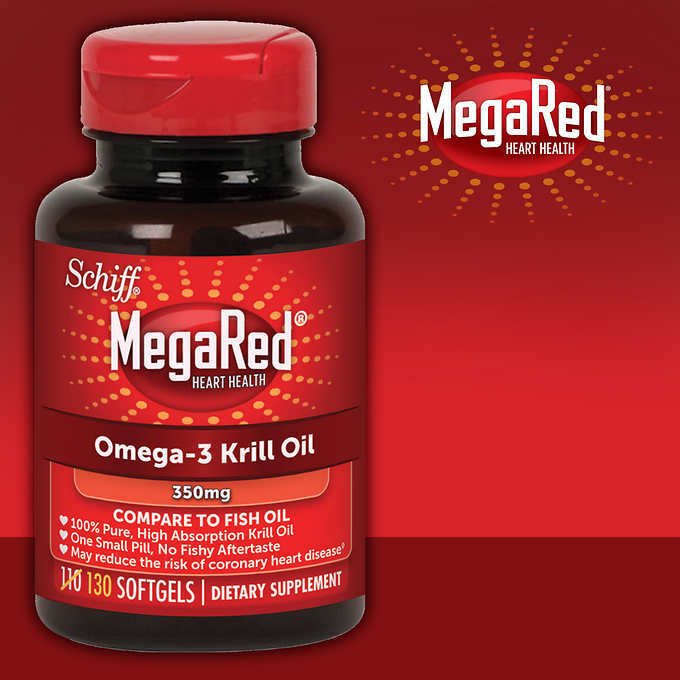 Schiff® MegaRed™ 350 mg Omega-3 Krill Oil - 130 Softgels SALE! Because the Omega-3 fatty acids in MegaRed® krill oil are carried to the body's cells in phospholipid form, they are easily recognized, incorporated and utilized by your body. MegaRed® krill oil mixes well in the stomach for efficient digestion. Importantly, because MegaRed® Omega-3's are carried in phospholipid form, there is no fishy aftertaste. The Omega-3 fatty acids in MegaRed® Krill Oil are carried to the body's cells in phospholipid form, and so, there is no fishy odor or aftertaste like there is with fish oil. And unlike fish oil softgels which can be larger is size, one small, easy-to-swallow MegaRed® Omega-3 Krill Oil softgel per day is all you need. 2 Controlled human clinical study of 350 mg MegaRed® for improving Omega-3 index, Aker BioMarine, 2010.